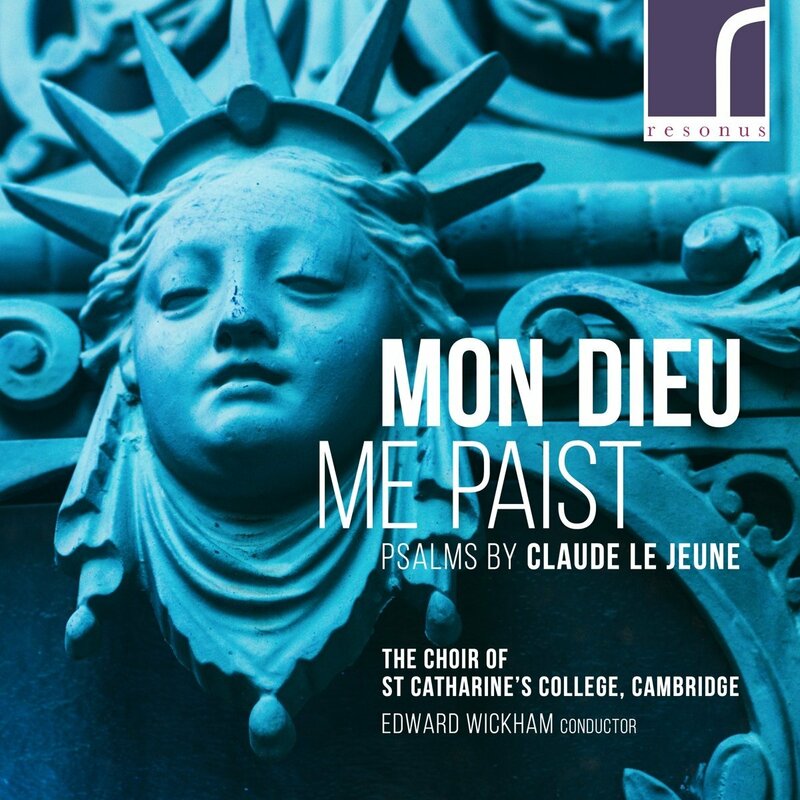 At first sight a disc of psalm tunes based on the Genevan Psalter does not seem like a particularly musically enticing prospect, but in the psalms of Claude Le Jeune, Edward Wickham and the choir of St Catharine's College, Cambridge have found a little gem. 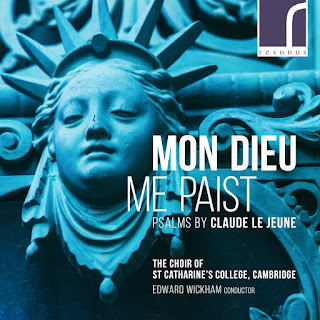 On this disc from Resonus Classics we have four of Claude Le Jeune's psalm settings from his Dodecacorde. Claude Le Jeune was a French Protestant composer who lived during the complex Wars of Religion in 16th century France. His Dodécacorde is a set of 12 psalm settings (one in each mode), which was published in 1598. The piece was reprinted once, in 1618 with different texts, and then seems to have disappeared. Though each psalm is based on a tune from the Genevan Psalter (which included such still performed tunes as the Old Hundredth), Le Jeune's settings are far from simple, certainly not the plain and direct psalm tunes that we might expect to come out of the Calvinist psalter. Claude Le Jeune had strong experience of the Wars of Religion, he was caught up in the siege of Paris (and in fact only the intervention of a fellow composer and a music loving sergeant saved his manuscript of Dodécacorde). Le Jeune's response to the troubles seems to have been to set a sequence of psalms which treat on peace and on strong Kingship. Each psalm is based on the Genevan psalm tune, but this forms just the cantus firmus, around it Le Jeune creates elaborate polyphony. But it is polyphony which seems neither to partake of Italian or French sacred music of the period. Le Jeune was interested in 'musique mesurée' where word stress and syllable length are reflected in the music. And his style is far closer to the Italian madrigal or French chanson. Partly this is because of Le Jeune's interest, but it should also be seen as reflecting the intimate personal nature of these pieces. There were not liturgical, but intended for people to sing at home; good Protestant texts and music, but given an elaborate gloss which provided much musical interest. Yet Le Jeune's writing is not showy for its own sake, he reflects the texts and creates very much a musical narrative which parallels that of the psalm text. Within a generation or two, this sort of music making had probably gone out of fashion. On this disc Wickham and his choir give us four of Le Jeune's settings (psalms 23, 45, 76 and 46), each one preceded by a simpler, hymn-like harmonisation of the relevant Genevan psalm melody. For good measure they throw in two of the best known Genevan psalm melodies, Old Hundredth and Cantique de Simeon. The choir of St Catharine's College sing this music with light, gentle tone and a lively sense of the innate rhythms of the music. This is quite a soprano led sound, but there is still a nice pointing to rhythms of the lower parts and overall there is a sense of clarity and delicay to the music. The CD booklet includes a valuable pair of articles by Edward Wickham and Tom Hamilton, on both the music and the religious / historical background to the period. Full texts and translations are included, in fact there are two translations both a literal one from the French and those more classic Coverdale ones which are familiar from the Book of Common Prayer. It is difficult to understand why this music is not better known, and certainly chamber choirs would do well to investigate the repertoire.This is subtle, not showy music and needs a few listenings for the details to tell.